6.1 Who Could Use a Hammock? For more information on the Vivere line of hammocks with stands, please see our Product Review section below. If portability isn’t of much concern to you, then you may want to go for a wooden hammock stand. Generally, these stands are quite a bit more attractive than metal stands and will look much more dramatic on your patio. 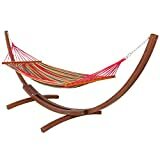 Our choice for Best Hammock with Wooden Stand is the BestChoiceProducts Wooden Curved Arc Hammock Stand. This unit includes a cotton bed-style hammock that, while comfortable, is not our favorite style of hammock. It also can only support one person or two smaller people in a pinch. That said, the whole package is very high quality, and is striking! To learn more about this product, take a look at the Product Review section below. Our choice for a budget hammock with stand combo is the Sunnydaze Brazilian Double Hammock with Stand. 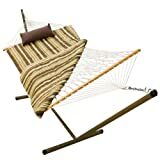 This cotton hammock with steel stand combo is a great package for the price and includes a nice 1-year warranty as well. There are seven color options to choose from, and the package includes a carrying case for added convenience. The frame is quite similar to the Vivere package but has a few fewer configuration options. The hammocks themselves are Brazilian style cocoon hammocks (which we like!) and can handle two people. Overall this is a great budget option! For more information on this hammock stand package, please see our reviews section below. Hammocks bring to mind breezy summer afternoons, lemonade condensing on an ice-cold glass, lazy tunes floating through the air, and deserted beaches at sunset. Climbing into one can feel like going on a mini-vacation. With the new systems designed to hold the hammock without needing big trees nearby, hammocks are more and more commonly an option for backyards, patios, and even bedrooms. With these thoughts in mind, this article focuses on several of the top hammocks with stands available on the market today. We will start off with a buyer’s guide to hammock stand sets and then will move onto in-depth product reviews of several of the options currently available. Here we examine several of the best hammock stand combos available, review them, look at the pros and cons of each, and pick our favorites. Here is the Double Brazilian Cotton Outdoor Hammock with Stand, made by Sunnydaze. It is an attractive choice and is available in 6 different color options. 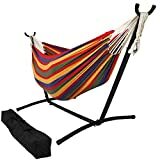 This package includes both a hammock and travel hammock stand and is one of the best portable hammocks with stand combos. The included hammock is a cotton cocoon-style hammock, designed to wrap around the user (as opposed to the hammocks with spreader-bars, which are more like a bed). The hammock selection is full of cheerful colors, with six to choose from. Alternately, it is possible to use a separate hammock with this stand: any cocoon style hammock 10′-12′ can be used. For comfort, there are five different adjustable positions on this hammock stand set. The stand is made of powder coated steel and is sturdy even when under load. Be sure to set this up on a fairly flat surface. The Sunnydaze Cotton Double Brazilian Hammock with Stand package includes a hammock, a stand, and a carrying case for portable hammock use. Note, however, that the case can rip easily, so be gentle with it. Also, it can be difficult to get the longest pieces of the stand into the case, so it may be best to use a separate bag for the hammock in order to enable the rest to fit in the bag comfortably. For cleaning, typically a spot wash or hose down is best, and the manufacturer does not recommend washing this hammock in the machine as the steel end loops could damage the washer. If necessary, it can be washed in the sink, and then hung out to dry. Setup is minimal on this freestanding hammock, and you’ll be lounging in 5-10 minutes with no tools. It is certainly friendly to those who like the idea of portability. The Sunnydaze is also one of the best hammocks for sleeping, due to the comfort and design of the fabric. The Sunnydaze free standing double hammock set comes with a 1-year warranty, which shows that Sunnydaze stands behind their product. BestChoiceProducts doesn’t like to use spaces in their name, but they do like to make nice hammocks. This hammock includes a space-saving stand that comes in three color options, Red Stripe (not the beer, unfortunately), Blue Stripe, and Desert Tan. The included hammock is 100% cotton, and the stand frame is all-weather resin steel. 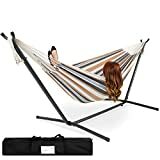 Additionally, BestChoiceProducts packages the hammock and stand with a convenient carrying case capable of fitting the stand pieces and the hammock. The BestChoiceProducts Double Hammock is a comfortable, attractive option for a hammock with stand combo. The stand is easily assembled and disassembled, and everything fits in the carrying case for easy portability. Keep in mind, however, that the weight of everything together is about 30 lbs, so if you’re planning on taking it for a long hike, that can be a significant amount of extra weight! Fortunately, once you get to your destination and you’re ready to set up the double free-standing hammock, it is very quick. The stand takes less than 10 minutes to get together, and the hammock takes only a few seconds to get placed on the stand. Just hook the metal loops onto the stand brackets, and you’re ready to relax! This hammock is a Brazilian style hammock and wraps around the user(s). It is pretty easy to bunch the edges up so that the hammock doesn’t completely consume you when you’re in it, should you feel uncomfortable being so enmeshed. Cleaning is pretty easy: just spot clean stains with soap and water. To keep the hammock lasting as long as possible, you should remove it from the stand when not in use. The stand will last pretty well outside in the elements. Just be sure that there are no areas where the paint has worn away, as these points can lead to rust. If it starts to wear or get scratched up, be sure to repaint with an enamel paint. The BestChoiceProducts Double Hammock with Stand is a good choice for a hammock and stand combo package, and everything is very well put together and well thought out. The stand is adjustable, should you choose to get another hammock for it in the future, so there are a few different setup configurations to get the hammock suspended properly. With three color options to choose from and a high-quality carrying case, these are among the best hammock and stand sets. Shipping is free, but unfortunately, there is no Amazon Prime available. The Vivere Double Hammock with Space-Saving Steel Stand is our favorite line of hammocks with stands. With 12 different color combinations to choose from and three different material options, the Vivere Double Hammock with Stand has it all. We are especially fond of the Sunbrella options for this hammock, even though they are certainly more expensive than Polyester or Cotton. Sunbrella is a little more abrasive against the body than cotton, but it is much longer lasting. The Vivere hammock is a Brazilian-style cocoon hammock and is quite comfortable. Should you not want the fabric to wrap too much around your body, you can fold the fabric under and keep yourself from getting too wrapped up. The hammock rests on the stand, which has four points and a metal base. It can easily sit in the sand, on the lawn, or on the patio, as long as the stand is (approximately) level. There are six adjustment points on the stand, so the hammock can be positioned for your exact needs. Getting in and out of the hammock should be pretty simple, assuming it is positioned correctly. The stand is painted either black or bronze, depending on the color of hammock chosen. If you start to see the paint coming off, it would be wise to repaint, as these hammock systems can rust if exposed to the elements. Setup and takedown of this unit is not difficult, and can be done in about 10-15 minutes without needing any tools. The whole package fits into the included carrying case to keep things tidy. Cleaning the Vivere line of hammocks is pretty easy. For the Sunbrella, simply use Dawn dish detergent to spot clean the fabric. If necessary, use diluted bleach to get out stains on Sunbrella fabric. For cotton, use a non-bleach detergent to clean the fabric. Do not use bleach on the cotton, as it will damage the fabric. If you don’t mind taking the hammock off the stand when not in use (very simple, takes 10 seconds), then the cotton may be the best choice, given the price difference. If you prefer the resilience of Sunbrella, you can simply leave the fabric out in the elements, and you’ll be good to go. Of course, there is a significant price consideration, as well! The Vivere Double Brazilian Hammock with Stand does come with a carrying case. This package is a great offering given the price point, and is our choice for Best Hammock and Stand. With so many options to choose from, and an included one-year limited warranty, this is an excellent choice for a hammock stand combo. The BestChoiceProducts Wooden Curved Arc Hammock with Stand is the only wooden hammock on our list, and it is our choice for Best Hammock with Wooden Stand. This unit is surprisingly inexpensive relative to the steel-framed models on our list and is of nice quality. The graceful curves on the Arc hammock stand are attractive without calling too much attention to themselves, and the whole feel of this unit is one of nature and solidity. The hammock is a bed-style hammock and includes the spreader bars to match the hammock stand. The bed style hammock is made of cotton, and the wooden arc stand is made of Russian pine. The wood is stained in a mild tone and is coated with a varnish for protection. Russian pine is quite attractive and looks to be robustly protected, but you should be aware that from time to time you will need to care for this or it will wear out. Some linseed oil from time to time should keep it looking good, and every so often it may need to be sanded and re-finished. When not in use, it is best to keep the hammock out of the elements, as the sun and rain can damage the cotton fabric over time. Take the hammock off the stand and bring it inside. Disconnecting the hammock from the stand is a simple task, perhaps 20 seconds. Cleaning the fabric is pretty easy if it gets mucked up. If necessary, spot clean the cotton with non-bleach detergent. The instructions are vague on this package, so you may need to do a little improvising to get it built. Fortunately, it’s not terribly difficult. As long as you look at the completed unit on the box, you should be able to figure out what goes where and get it all assembled. The hammock is rated for 275 lbs or two people, but two people would be pretty cozy on this hammock. Users should assume that in most cases this will be only a one person hammock. Wooden framed hammock stands are certainly more eye-catching than steel frames. If portability isn’t of significant value to you, then the BestChoiceProducts Arc Hammock Stand may be a good choice. The bed style hammock isn’t what we typically like, but it is attractive, of good quality, and is comfortable enough. This Algoma Hammock with Stand is a great option and is one of our favorites among the bed style of hammock. This package comes with a cotton rope hammock and includes a polyester pad and pillow. The frame is made of steel and is brown powder coated. It does not come with a carrying case. The Algoma hammock stand combo is a single person hammock and is designed as a bed style hammock. It uses a spreader-bar system so that the user doesn’t get completely wrapped up in the fabric, but it is also less stable than a Brazilian style hammock. The size of this stand makes it one of the larger hammock stand combos on this list: if you are considering sometimes using this inside, be sure you have enough room to accommodate the 12′ stand length! The polyester pad is optional and can be removed if that is preferable. The pad is quite comfortable and helps with the overall experience of this hammock stand combo. Unfortunately, the pad and pillow are only available in the one color scheme shown here, and no other color options are possible. The setup of the frame is easy and requires no additional tools. The frame is not the sturdiest on our list, so some care should be taken with the weight limit estimates. The Algoma 8911E Rope Hammock with Stand is a good package for a bed style hammock with metal stand combo and is among our favorites in this category. For additional peace of mind, Algoma offers a one year warranty on this package. In this buyer’s guide, we go over the hammocks with portable hammock stands included product category, and offer some general information that will make choosing the right product for your specific needs a little easier. Who Could Use a Hammock? Hammocks can be enjoyed by everyone — all that’s needed is the desire for relaxation. Young and old, in the tropics and in the mountains, in the backyard, on the deck, or even in the bedroom, virtually anyone can enjoy the relaxation that comes from spending time on a hammock. Many find it to be a soothing experience to sway in the breeze, listening to the wind or some quiet music, with gin and tonic in hand. Depending on the size and configuration of your home there are many spots where hammock could be of practical use to you. A balcony can be a great place to place for a hammock, as can a backyard or patio space. Gardens are a wonderful spot for peaceful relaxation. Additionally, a sitting room or a bedroom may be a good place for a hammock. With the introduction of hammock stands, there is no need for trees or other supports to define the location possibilities of a hammock. These can go anywhere! The majority of people in Western Society sleep on a traditional bed, with a mattress and bed frame or box spring for support. This provides a great deal of comfort, but it is quite impractical for outdoor use. There is just something special about being able to nap while outside. When the weather is right, sleeping outside is a delightful experience. Obviously, you can open the windows in the bedroom and sleep on a bed, but that’s just not the same. Hammocks provide the opportunity for easy napping outside. Many people use hammocks to sleep through the night, outdoors or in, but the majority use it for napping, daydreaming, and snoozing on a quiet afternoon in the sun. Hammocks are a great supplement to a traditional mattress bed. They are portable, comfortable, and with the new designs coming to the market, are often quite easy to set up and take down. There are two common hammock designs: bed hammocks and cocoon hammocks. Here we discuss the differences between them and the advantages and disadvantages of each. A bed style hammock is a hammock designed with wooden spreader bars that span each end of the hammock. These bars function to spread the mesh of the fabric hammock out across a wide area, creating a bed-like surface. When a user climbs into this style hammock, the spreader bar system prevents the fabric material from wrapping around the user. Some hammock users find this type of hammock more comfortable and less confining than cocoon-style hammocks, however, these hammocks are much more prone to flopping over. Because the mesh is spread out by the spreader bars, balance can be an issue. If the user becomes unbalanced, it is easy to fall out of this type of hammock. Typically, the material design for this type of hammock is a rope mesh. Common materials for the mesh include nylon, hemp, and cotton. The mesh usually has large voids between rope ties, sometimes in excess of 2 inches in diameter between knots. This allows for the rope to flex and move depending on the balance requirement needed, or different types of users in different circumstances. This mesh is also often fairly long-lasting and handles the elements well. Some bed style hammocks will supply additional fabric that sits on top of the mesh to supply more support and comfort. The spreader bars on these units are usually made of wood. Typically this wood will be unfinished or will have some sort of clear coat or stain on it. If the wood is treated, prolonged exposure to the elements will mean that the wood will need to be refinished from time to time. Cocoon hammocks, (also often called Brazilian, Jungle, Nicaraguan, etc.) typically do not have a spreader bar on either end of the fabric material. The user of a cocoon hammock simply climbs into the mesh fabric, and the sides of the hammock envelope them, wrapping him or her up in a cocoon-like experience. These hammocks can feel more confining than a bed-style hammock, but often they are found to be more comfortable, and an overall more pleasant experience. There is little likelihood of falling over in Brazilian style hammocks, and the users don’t need to worry at all about balance. That means it is easier to relax more deeply, and that’s the whole point of a hammock, right?! Brazilian style cocoon hammocks are usually made of a nylon or cotton rope that spans the length of the hammock. The nylon is then woven with additional fabric such as Sunbrella, cotton, nylon, or hemp to create the support structure. Ideally, when setting up a Brazilian-style cocoon hammock, the top end should be hung slightly higher than the bottom end. This subtle angle will help make the hammock a bit more comfortable when it is being used. When resting in a cocoon-style hammock, try to position your body at a diagonal angle to the line of the hammock. This will prevent the material from bunching up too much around the body, and make it easier to get in and out of the hammock. Often those with back and joint pain will find this position to be the most natural and will get the most relief in this position. We here at OutsideModern are strong proponents of the Brazilian cocoon style of hammock because they are much more stable. These tend to be much more comfortable than bed style hammocks, and in our opinion, bed style hammocks are inferior for the vast majority of users. Bed style hammocks were introduced to the market in order to make people who were used to sleeping in a traditional mattress-type bed comfortable sleeping on something similar in form, but truthfully these units are less comfortable in the end. The risk of becoming unbalanced, falling over, and getting injured is significant, and that defeats the purpose of having a hammock! It is impossible to fully relax and sink into a bed style hammock, and if you do manage to fall asleep, you run the risk of flipping out onto the ground if you move the wrong way. That said, if you are completely unfamiliar with hammocks, or if you are uncomfortable with the sensation of being wrapped up in fabric, a bed style hammock may still suit your needs. Here we examine several of the most common fabric materials found in hammocks. Nylon – A synthetic fabric made of petroleum derivatives. Not exactly the most environmentally-friendly choice, but strong, cheap, and relatively common. As a general rule, nylon is about twice as strong as cotton, given the same material density. Hemp – A natural fiber, typically quite strong, and with a very low environmental footprint. Not a particularly common material for hammocks, but it is occasionally used. Cotton – A standard fabric made from the cotton plant. Fairly environmentally friendly, and with a high degree of comfort. Relatively inexpensive, and can feel good on the skin. Sunbrella – An acrylic fabric that is specifically made for outdoor materials. It is water-resistant, fade resistant, mold/mildew resistant, stain resistant, and easy to clean. Generally, Sunbrella fabric is considered “top of the line” when it comes to outdoor fabrics. It’s also relatively expensive. A hammock stand is a custom-designed frame specifically for use with a hammock. The hammock frame typically consists of a base with legs, and two posts that rise up into the air 7-12′ apart. These posts have attachments on the top where each end of a hammock is inserted. The frame suspends the hammock in the air and allows you to use a hammock without attaching the ends to trees, walls, or any other structures. Frames allow hammocks to be much more easily portable units. Most frames are easy to take apart and are often collapsible and then be placed into a bag for easy portability. The two common material types for hammock stands are metal and wood. Here we discuss the advantages and disadvantages of each. Metal hammock stands tend to be cheaper than wood, and are often more practical for portable use. These stands are usually collapsible hammock stands, and the metal pieces are designed in such a way that they can fit into a bag that can be taken on camping trips, to the beach, or simply stowed away in a closet for future use. Common metal types used in hammock stands are stainless steel and aluminum. Metal stands are relatively maintenance free. If scratches form, or the paint chips, there is potential for rust. Every so often it would be wise to repaint the metal frame with an enamel paint in order to keep it well protected from the elements. Wooden hammock stands are usually more sculptural and architectural in design and are often extremely beautiful. These units tend to cost significantly more than metal frames (though not always!) and are typically used in situations where users don’t feel the need to take the hammock and send it with them on their travels. If you are looking for a statement piece for your garden or patio area, a wooden stand maybe for you! However, be sure to consider the maintenance of these units and the fact that they require protection from the elements. Wood will need to be refinished from time to time, so be sure to take that into account. Additionally, when possible, wood should be covered for protection, when not in use. To sum things up, there are several considerations that buyers should keep in mind when examining different hammock stand combos. While examining our product review area below, be sure to keep these attributes in mind to give some context to your buying decisions. Considering material options is important, both for hammock fabrics and stands. There are differences in fabrics that can impact comfort and durability. Brand name fabrics like Sunbrella are often expensive but may end up being cheaper in the long run because these will last longer and will require less maintenance than cheaper fabrics. For stands, both wood and metal are good choices and offer advantages and disadvantages. As we discussed in the earlier section, determining the style of hammock is very important. We generally prefer the cocoon style hammock and think it is usually a superior design. Others may find the bed style hammock more familiar to what they are used to, and may find it more comfortable. Regardless, be sure to consider hammock design. Most of the hammocks on our list give specific size and weight information. Many hammocks are capable of supporting the weight of two average-sized people at once. If you have heftier members of the family, you should pay extra attention to size capabilities of these hammocks. Additionally, stands will have a maximum length that they can spread. This length information will give you an idea of how long it is. Should you wish to take your hammock with you on road trips, camping, etc., portability will be an important attribute. As there are significant differences in folding hammock stand design, be sure to consider which ones offer easy assembly and disassembly, and which ones have included carrying cases. One of the most important aspects consider when shopping for a hammock stand combo is the price. Everybody has a budget and you want to be sure you get the best product for your needs and your budget. As with everything, the value is key: you want to try to find the least expensive product that meets your requirements and is built with the highest quality at that price point. Thank you for sharing the information about these hammock products..